Want to take a trip to Macau? It’s the offshore Chinese equivalent of America’s Las Vegas. And then try our luck at the casino table games. The House Wins — Always! While I’ve got no problem with restaurants, light shows, and having fun…. I hope you caught my sarcasm when I mentioned the table games. As a rational investor, I just don’t consider it “fun” to gamble with slot machines or playing one of the table games at a casino. About the closest I’ll ever come to that is a poker table, where you’re playing against other people — many of whom regularly make exploitable mistakes. When it comes to the house games, casinos are very careful to rig the statistics so that the house always wins. Sure, you may get a few chips here and there. But over time, if you play long enough, you will give more money to the casino than they take from you. After all, how do you think these companies can afford all of the luxurious surroundings? Casinos are rigged to give players a chance of winning occasionally, while pulling in reliable cash over time. As investors, we can take a lesson from these companies, and look for opportunities in the market where we can enjoy similar odds stacked in our favor. There’s been a lot of talk lately about the trade war negotiations and who the ultimate winners and losers will be. It’s been said many times that China has a lot more to lose than the U.S. That’s because China needs to sell its goods and services to the U.S. in order to stay economically viable. America, on the other hand, doesn’t need China quite as badly. So with that in mind, investors have a unique opportunity to take advantage of a special situation skewed in their favor (just like a casino skews the table game odds in their favor). First of all, let’s take a look at where the market for Chinese stocks are right now. Investors have naturally sold Chinese stocks in fear of the escalating trade war hurting Chinese profits. So at this point, the damage has already been done and the basic assumption is that the trade war is happening. So if you invest in Chinese stocks right now, you’ve got limited risk because the idea of a trade war has already been accounted for. Stocks are less likely to trade lower at this point because the perception is already pessimistic. On the other hand, if China blinks, and concedes to a deal, it’s great news for Chinese stocks. A lowering of trade barriers would relieve much of the fear investors currently have and could lead to a massive swing higher for Chinese stocks. So today, investing in Chinese stocks is a lot like being the house at a casino table game. You’ve got some risk of a small loss… But you’ve also got a very high probability of winning a large amount! Put enough situations like that together in your investment account, and you’ll rack up some impressive investment gains! So which Chinese stocks should you be looking at right now? 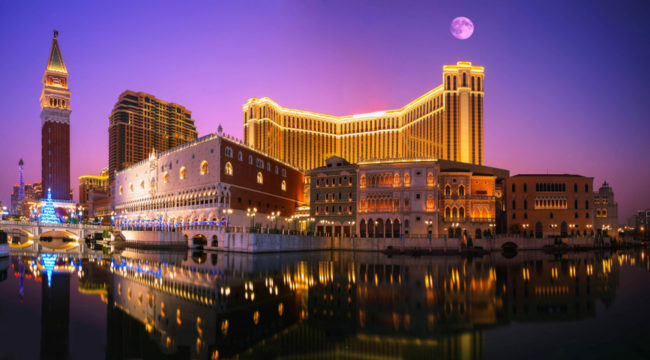 I’d suggest taking a close look at resort and gaming companies that operate in the offshore city of Macau. This is one of the most exciting destinations for vacationers in all of Eastern Asia. The best part is, you can actually invest in some well-known U.S. companies that have big bets in Macau. That way you still get the relative safety of U.S market regulations, while enjoying profits from a rebound in the Chinese economy. Two of the names I’ve got on my radar are Wynn Resorts (WYNN) and Las Vegas Sands (LVS). Both of these companies are extremely profitable and they know how to set up the perfect destination resort. Both are heavily invested in Macau, and stand to benefit from open borders, more tourism, and a rebound for Chinese stocks. Both of these stocks have pulled back as the trade war arguments have become more heated, which gives you an even better shot at significant gains when the conflict is ultimately resolved. So today, I suggest you take a page out of the casino’s playbook and use Chinese stocks (or plays on a rebound in Chinese trade) to set the odds in your favor.